Size: 14 by 18 inches on an 15 by 23 inch page with wide margins for framing. 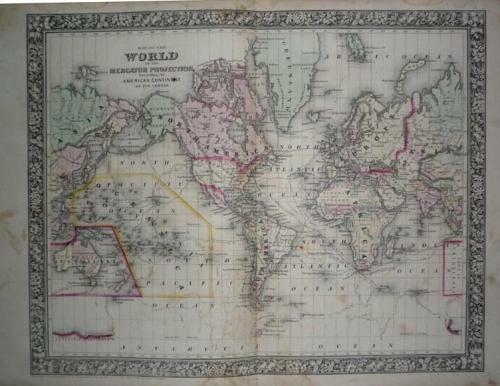 This is an original 1860 handcolored map from Mitchell's "New General Atlas." The map is dated at the bottom as: "Entered according to Act of Congress in the year 1860 by August Mitchell ...."
This is a classic Mitchell map with the decorative floral border style that is much sought after from maps of this period. Of note: Alaska is Russian territory and many areas of Africa and Australia remain unexplored. The map is printed on heavy paper, blank on the reverse side and is in good condition with overall tonal ageing as expected. It does have some toning that is noticeable in the margins and a mellow yellow look of old "aged" paper that is slightly more apparent on the map than on the photograph. This does not effect the detail on the map itself and may be considered as 'antiquarian'. Some stains on the verso that do not show on the front of the map.